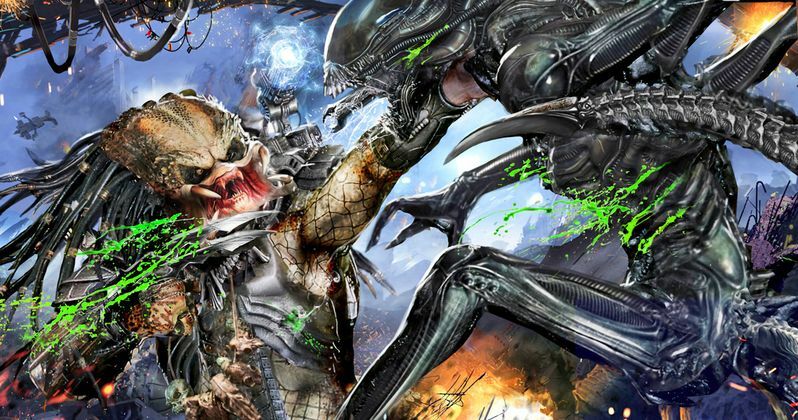 Unused props from Shane Black's The Predator indicate that the Alien franchise would have been incorporated into the sequel. It appears that one possibility for the ending would have been quite different from what we all saw on the big screen. Black had a vision to bring the Predator franchise back to its roots in an attempt to revamp the series and make more movies along the way. However, things changed a lot behind-the-scenes and this reboot suffered because of it. Multiple edits and reshoots left a huge scar on The Predator, which means that a sequel is unlikely. The Predator VFX artist Jon K. Miller recently posted some behind-the-scenes images, including a FaceHugger-inspired breathing apparatus that was supposed to be used as an alternate ending to the movie. At the end, a mysterious pod shows up that holds the Predator Killer suit, which was an obvious attempt at teasing a sequel. However, it looks like the occupant of that pod was going to be much different since the breathing apparatus has the Weyland - Yutani logo on it from the Alien franchise. It's not clear who or what was originally intended to be in the pod at the end of Shane Black's The Predator. Arnold Schwarzenegger was rumored to make a cameo, but the iconic actor apparently did not want to have anything to do with the sequel. Concept designer Fausto De Martini also posted an image of what the pod was going to look like during the alternate ending, which also features the Weyland - Yutani logo. The breathing mask was built last-minute, according to Martini and Jon K. Miller. The context surrounding these new images from The Predator alternate ending is not clear. However, it is believed that there is some footage of the alternate ending that Jon K. Miller hopes is on the Blu-ray edition of the movie. Shane Black originally insisted that there would not be anything from the Alien franchise in his version of the story, but it looks like he may have changed his mind later in the production process after some lengthy reshoots and long days editing. The Predator is a fun movie, but it wasn't what a lot of diehard fans were hoping for, and the ending seemed to be an obvious attempt at grasping for a sequel after some editing. Shane Black's The Predator suffered from all of the editing and reshoots that occurred before the movie hit theaters. The story is a little all over the place and the different ideas and scenes that were cut don't help matters at all. There were supposed to be two more good versions of the Predators and even more hybrids, but all of those ideas were scrapped at the last minute. In the end, it really doesn't look like a sequel will be happening any time soon. You can check out the unused Alien elements from The Predator below, thanks to Jon K. Miller's Instagram account.